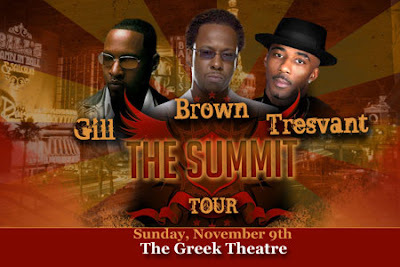 As the impressive 25th anniversary of R&B/pop group New Edition is celebrated, three of the group’s front men, Bobby Brown, Johnny Gill and Ralph Tresvant, will embark on the 2008 Summit Concerts tour @ the Greek Theater as “The Heads of State.” The show promises to be an evening of hot jams, classic ballads and new tracks from three of the most talented and charismatic artists in soul music. I would love to be a fly on the wall at this dress rehearsal, and I guess the main question is, where's Ricky and Ronnie? (We know Mike's got a gig with Diddy, hmmph). Show starts this Sunday, November 9th@ 7:30pm. For tickets through our lovely ticketmaster friends, click here. Thanks Candy! Isn't BBD performing @ House of Blues?